Since setting up practice in 2008, Patrick Lewis Architects have collaborated with many wonderful clients and skilled artists, designers and makers. 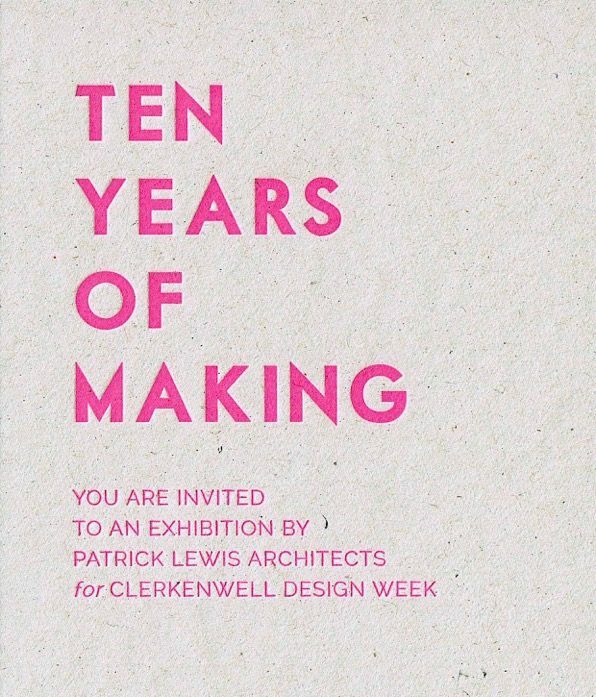 To celebrate 10 Years of Making, and in conjunction with Clerkenwell Design Week, we invite you to our exhibition at the Tripp Gallery from the 22nd – 26th May 2018. The exhibition will showcase the stories of eight projects through architectural models, drawings, photographs and samples. To mark the opening night of the exhibition and Clerkenwell Design Week, please join us to listen to 5 of our favourite creative collaborators talk about their passions on the theme of making. Our speakers are Patrick Lewis (Architect), Anna Glover (Textile designer), Mervyn Rodrigues (Structural Engineer), Frederic Casella (Film Director & Writer), Ed Frith (Architect & Academic). This event is ticketed. Book your free ticket here. Please note that there is no level access to the venue. Before setting up his practice, Patrick was an Associate Partner at 23 Architecture & Guy Stansfield Architects. Educated at Beadles and professionally trained at the Oxford School of Architecture, The AA, Greenwich and Westminster Universities, Patrick has also taught at Greenwich University and Birmingham City University. He is currently an examiner for the ARB and a mentor for the Princes Trust. Anna founded her multi-award winning design studio in 2014, specialising in bespoke wallpapers for luxury interiors. The studio works with interior designers, architects and private clients to create spaces that tell a story. Their distinctive aesthetic has evolved from Glover’s background in artworks for fashion, as well as her use of traditional hand painting techniques. In 2014 Anna collaborated with Patrick Lewis Architects on their project at Brackenbury Road. This Spring Anna has launched an exclusive clothing collection with H&M! Since setting up his practice in London in 2003, Mervyn has consulted on a number of high profile, award-winning buildings across the educational, residential and commercial sectors. Prior to this, Mervyn was a director at Peter Dann Limited and principal senior engineer at Ove Arup. Mervyn has worked closely with Patrick Lewis Architects on many projects including Molyneux Street in London, which won an NLA ‘Don’t Move Improve!’ 2017 Award. Frederic Casella is an award-winning director and writer with an eclectic range. His broadcast documentaries have featured bankrupts, ventriloquists and hippos, while his short fiction films have been lauded at some of the world’s most competitive festivals including the Sundance Film Festival. In 2014 Fred appointed Patrick Lewis Architects to refurbish, remodel and extend his London townhouse. The project features in the ‘Ten Years of Making’ exhibition. In both practice and research, Ed explores the movement between body and architecture. With his partner, choreographer Caroline Salem, they have designed, lectured and developed performances and projects in the UK, China, US and Spain. Ed and Patrick ran the Postgraduate Unit, Gateway Games, from 2007-2012 at Greenwich University School of Architecture. His writing has been published in Building Design, Architects Journal, Architectural Design, the Guardian, and on Archinect. A lesser-known fact is that he once worked as Berthold Lubetkin’s gardener!